"ASHRAY." If you can read this, you can pray in Hebrew. For thousands of years, Jews have been reciting Tehillim (Psalms). The majestic words of King David punctuate liturgy and prayers. In times of joy, Jews express their gladness and thanks to the Almighty through its soaring prose; in times of distress, they pour out their hearts to Him in earnest entreaty and petition through its powerful words. Across the world, groups gather regularly to recite the entire book of Psalms. 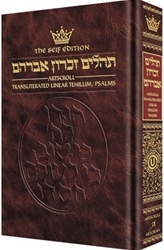 Many Jews follow a daily schedule to complete Sefer Tehillim (the Book of Psalms) regularly. But what if you don't comfortably read Hebrew? How can you participate? 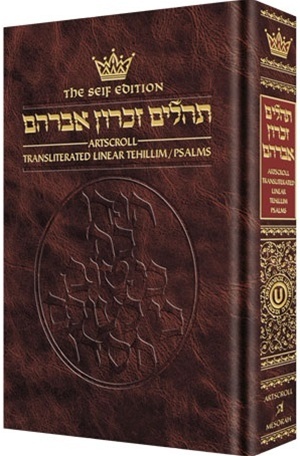 ArtScroll's new Seif Edition Transliterated Tehillim is your answer! Like the widely popular Transliterated Siddur, Machzor, and Haggadah, this new rendering of Hebrew text in phonetically accurate English characters makes it easy to enjoy the beauty, rhythm, and power of the sacred language. If you have friends or family that struggle with reading Hebrew, this is the volume they've been waiting for. It makes a thoughtful gift for bar and bas mitzvahs, weddings, birthdays, newborns, and special occasions. Features an insightful, abridged commentary and a schedule for daily, weekly, and monthly reading.